When it comes to bathroom designs, not many products give you more options to choose from than bathroom tile. From the classical, smooth look of polished marble to the ultramodern feel of iridescent mosaic glass bathroom tile , there is a tile out there to match just about any bathroom design scheme you can imagine. While your options are virtually limitless when it comes to appearance, finding a tile that serves you well in other ways is just as important. Here are some things to consider as you shop around for the right bathroom tiles for your Atlanta, Alpharetta or Roswell bathroom remodelling project . 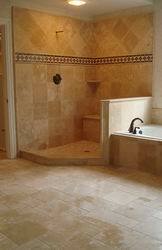 You should be thinking about tile size when it comes to choosing wall or flooring product . Presently, mosaic tile (tile that measures less than 2") is the talk of the town, though you should plan ahead for the aesthetic effect smaller tiles bring to tight spaces. Smaller tiles can make a bathroom feel more crowded, busy, and compact, whereas installing larger bathroom flooring tiles in your home can help make a small bathroom feel much larger than it really is. 1) It goes out of style.Bathroom tiles in Atlanta or Alpharetta is one of the trendiest sectors of the home improvement industry, making it very important that you think about how your kitchen, bathroom, or basement flooring tile is going to look 20 years down the road, not just whether it looks like that picture you found in Better Homes and Gardens. Selecting the right tiles begins with choosing the right products. That is easier said than done, however. Alpharetta, Roswell or Atlanta bathroom tiles are more varied than just about any other product in home improvement. Not only does stone and ceramic tile offer you a bevy of choices in and of themselves (polished, tumbled glazed, unglazed, sealed, sandstone, imitation stone, stamped, porcelain, limestone, decorative and painted, just to name a few. ), but there are also concrete, glass, copper, stainless steel, , and engineered stone as well. With such a wide range of options to choose from, your best plan of action is to think in broad terms and then narrow your kitchen or bathroom tile options down to more specific products. Questions worth asking include whether you prefer traditional or contemporary designs, natural or modern materials, and whether you are more concerned with turning heads or sticking to a budget. Having the answers to these questions figured out ahead of time will help steer you, and your remodeling contractor toward a bathroom tile in Atlanta GA or Alpharetta GA that is sure to meet most, if not all, of your criteria. Many Homeowners make the mistake of thinking that generic tile classifications, such as stone or ceramic , are a good barometer for how tough their tile is going to be once it's installed. 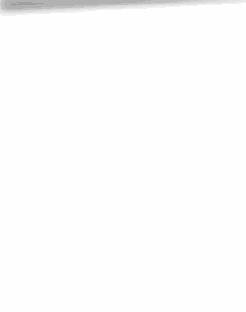 Unfortunately, that is not the case. Stone, Ceramic, Porcelain, Travertine and other tile materials vary widely in fragility, density , and durability. Ask specifically about hardness and durability ratings of any tile you are seriously considering buying, and make sure you are clear with the retailer about where you plan to install it (ceramic tile meant for wall installations simply won't hold up under the heavy foot traffic that flooring tile in Atlanta or Roswell GA has to endure). Often it is longevity, not looks, that determines whether you choose one style of tile over another for your Lawrenceville,Duluth or Gwinnett bathroom remodeling project. 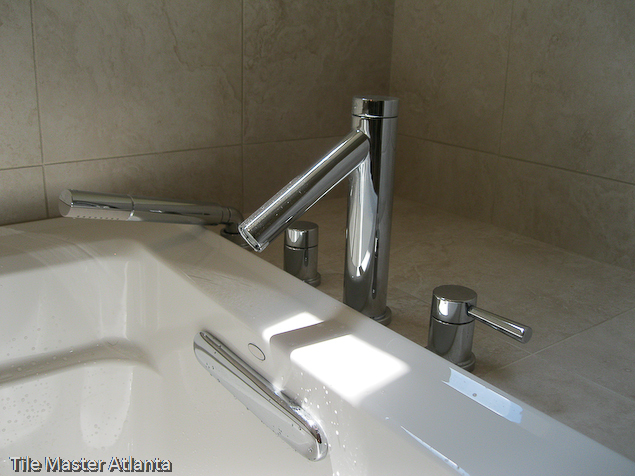 All that being said, it's a smart homeowner in the Atl who seeks out the services of a retailer, tile installer or bathroom designer experienced in designing and laying bathroom, Kitchen or basement tile . 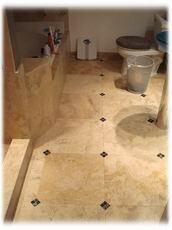 Even if you perform the installation yourself, paying aprofessional to help you make smart choices when it comes to bathroom tile and flooring tile is worth every penny if you want to end up with bathroom tile that functions every bit as good as it looks once you have it installed. Bathroom remodeling Atlanta GA – Tile MasterProfessional Bathroom remodeling Atlanta, Atlanta bath remodeler, Bathroom remodelers Atlanta, Bathroom remodel Atlanta. Bathroom remodeling Lawrenceville GA Professional Bathroom remodeling Lawrenceville GA,, Lawrenceville bath remodeler, Bathroom remodelers Lawrenceville, Bathroom remodel Snellville GA .
Bathroom remodeling Dunwoody GA – Tile Master Professional Bathroom remodeling Dunwoody, Sandy springs bath remodeler, Bathroom remodelers Dunwoody, tile installation dunwoody. Bathroom remodeling Roswell GA – Tile Master Professional Bathroom remodeling Roswell, Roswell bath remodeler, Bathroom remodelers Roswell, Bathroom remodel Roswell GA.
Bathroom remodeling Alpharetta GA – Tile Master Professional Bathroom remodeling Duluth GA, Duluth GA bath remodeler, Bathroom remodelers Duluth GA, Bathroom tile installation Duluth GA.